I used a matching 40-wt. trilobal polyester thread (shiny and beautiful like rayon, but stronger and more lightfast), Superior Threads Living Colors # , for the top row. I used a darker 40-wt. polyester thread for the wreaths in the second row, Superior Threads Nature Colors # . For the background I used Mettler 60-wt. “embroidery” cotton in a matching color, and in the bobbin I used Superior Threads The Bottom Line. If you click the photo above, it will open and enlarge. As you can see from the overall shot, from a distance the matching color-thread quilting nearly disappears. The dark color stands out a lot, though, especially with the “pearl” circle in the center. If I were quilting a real quilt, I personally would choose something in the middle of these two colors. I think the reddish color is too strong, but the matching color doesn’t stand out (so why do all that hard work if no one can see it?!). Here’s a picture of the quilt “in progress” under the sewing machine. As you can see, I used the easy-on-the-eyes blue marking pen (the thick one). If I had had the fine-point blue pen, I would have used it. The line on the Dritz wash-out pens is so thick (nearly 1/16th of an inch) you have to choose whether to quilt on one side of it, the other side of it, or aim for the middle! stippling; on this one, I varied the size of the stippling. On the top row I used a fairly large stipple; on the bottom row I used a very small stipple to help the wreath stand out. Between thee and me, I detest stippling most of the time. 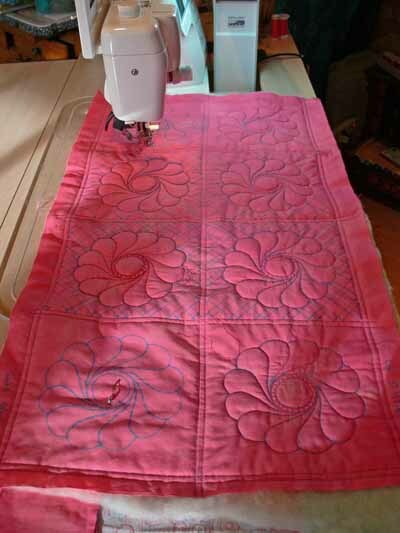 It has become SO overdone with the advent of machine quilting. There are lots more interesting ways to compress the background, but it does have its place (though infrequently! 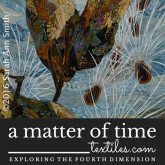 ), and in this instance using a simple background quilting gets the point across better than something more creative. 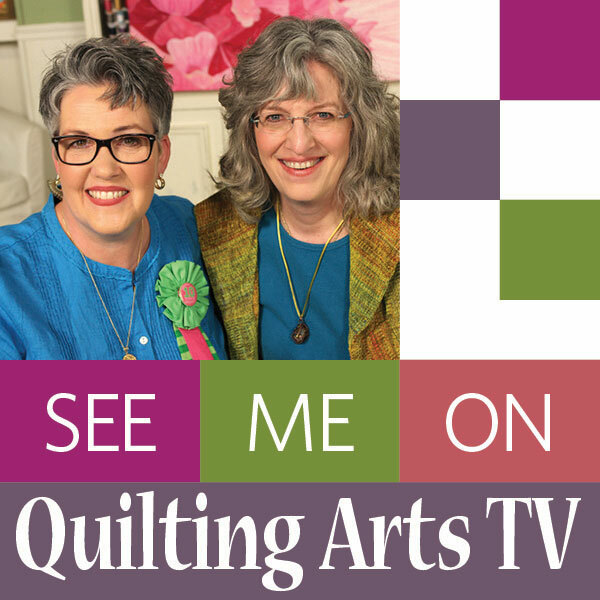 Here’s a close-up of the no-background quilting blocks in the close up below…on the left. Boring and I think the background ripples some. I don’t personally care for this look, but certainly understand why some folks choose it, especially when hand quilting a big quilt! On the right you see the cross-hatching in a similar scale as the wreath. By using contrasting lines (curved and straight), you get some differentiation between the motif and the background. Especially when looking at the block quilting in dark thread, it works. When you reduce the scale of the cross-hatching, you get further contrast of scale as well as line. This really helps accentuate the motifs. 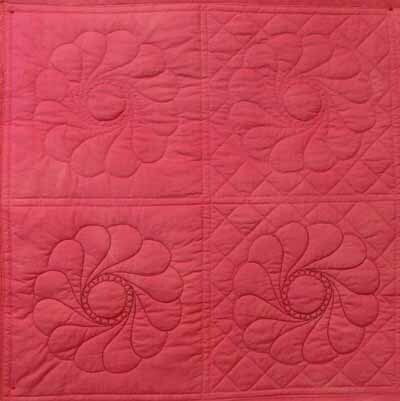 In antique quilts, this is how they got those beautiful wreaths and feathers to stand out and be noticeable, even though they were usually using white thread on muslin. This photo will enlarge if you right-click and open it in a new window or tab. In the stippling examples, boooorrrrriiiinnnngggggg, the larger stipple doesn’t do much AT ALL for me. The scale is too similar to the curves in the wreath. No significant contrast in line or scale. In the second block, the small scale of the stippling really helps “pop” the motif, as well as the small-scale cross-hatching. However, I still think there are lots more creative ways to deal with the background than boring old stippling. 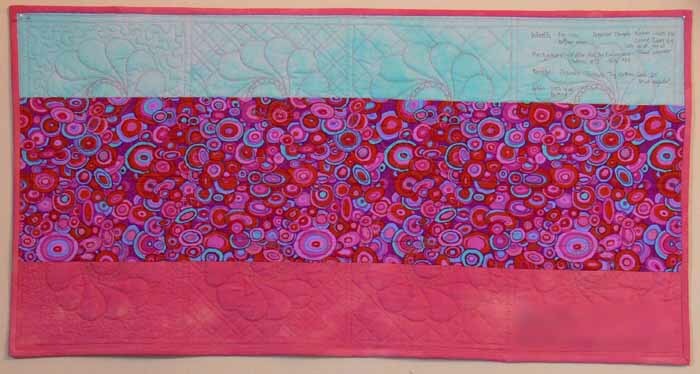 You can see the nearly-no-mark sampler I teach in my intro machine quilting classes here or here. 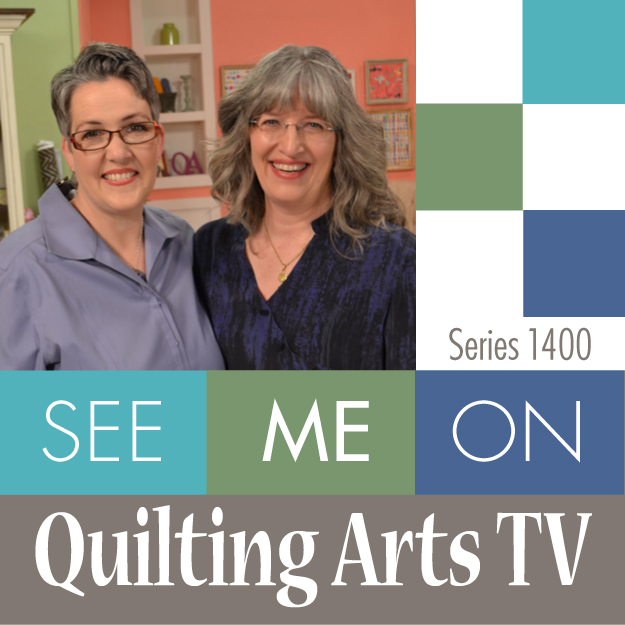 That sort of background quilting is a LOT more fun (and visually interesting, at least to me!). If you right click on this image, you can open it up larger to see more detail (I hope!). 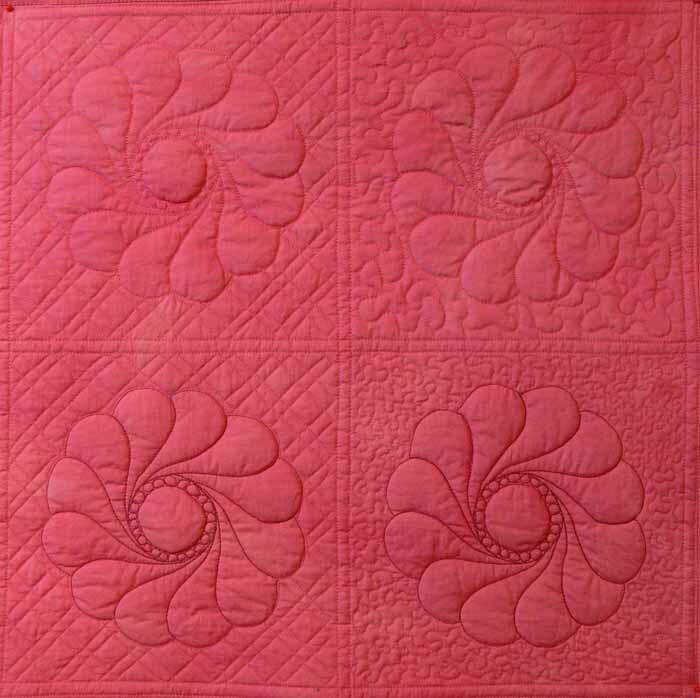 When I finish my Hawaiian-style jumbo 9-patch quilt, Nourish the Body, Nourish the Soul, I’ll share the background quilting on that and on a couple of my pattern quilts. 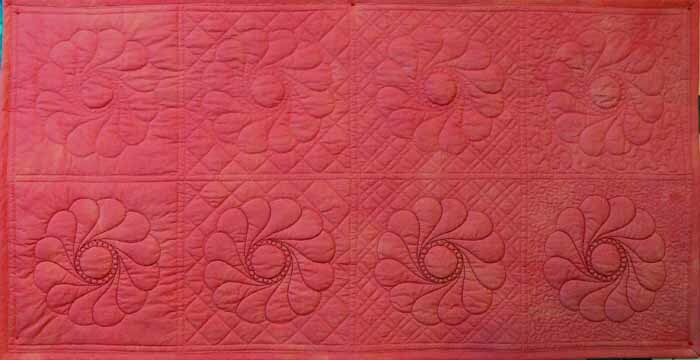 This entry was posted on Wednesday, January 9th, 2008 at 10:53 am	and is filed under art quilting, Teaching / Classes, Techniques, Tutorials. You can follow any responses to this entry through the RSS 2.0 feed. Both comments and pings are currently closed. Fantastic post ! Great job -as always !! Lots of good information there. I’m always at a loss when I get past stipple (or meander as it usually turns out) and you have given me some ideas here.Thanks. Your quilting is very nice! I could never had done that well on my domestic machine! I enjoyed looking through the rest of your blog, especially the snow pictures. We’ve had one measureable snow in the past 35 years! Thank you for the great pictures here and great info. I really like the smaller scale cross-hatching — that’s the look I’m going to be aiming for. (And I’m with you — don’t like the stipple stitch). GREAT post, SA! I can’t wait fro your book – it’s going to be so PACKED with info!